The general news media and specialty publications are major ways most Americans get their information about science. But many also are exposed to scientific subjects through movies and television shows – and they come away from these fictional portraits with a positive impression of working in science, technology and medicine. Roughly eight-in-ten Americans (81%) say they at least sometimes watch one or more of three types of science-related entertainment shows and movies: those focusing on criminal investigations, ones about hospitals and medical settings, or science fiction, according to a Pew Research Center survey conducted in May and June. While many of these viewers come away with a favorable view of scientists, they also regard the TV shows and movies as focusing more on entertainment than getting the facts right. Although such popular entertainment can inform, many in the scientific community have worried over how the media can also create misconceptions – such as by creating unrealistic standards for forensic evidence in the public mind or by perpetuating stereotypes of the “mad scientist” clad in a white lab coat. A majority of frequent viewers of criminal investigation shows (56%) and about half who frequently watch medicine-oriented programs (51%) say these shows give a positive impression of working in science, technology and medicine. And, although contemporary science fiction sometimes presents a dystopian view of the future, 44% of frequent viewers of such movies and TV shows say the genre offers a favorable impression of the future of science, technology and medicine. Only 15% say that science fiction creates an unfavorable impression. Majorities of Americans realize these types of science-related entertainment are not entirely accurate in their portrayal of science, the Center’s survey finds. By roughly two-to-one, Americans think medicine-oriented shows and movies prioritize entertainment (66%) over accuracy (32%). Similarly, Americans say crime shows focus more on entertainment than portraying science, technology and medicine in a realistic way by a margin of 62% to 35%. 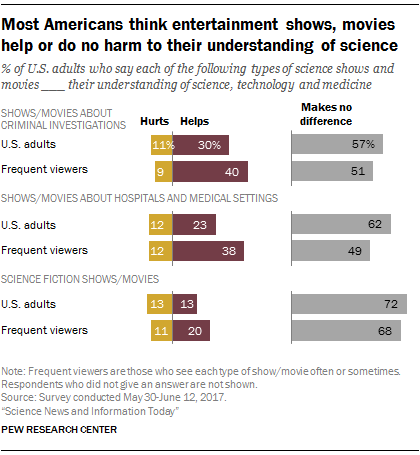 But, the majority of Americans don’t believe entertainment media undermine their understanding of science, technology and medicine. About half of frequent viewers of crime-focused shows (51%) say these programs have no effect on their own understanding of science-related topics. More say these shows help than hurt their understanding by a margin of 40% to 9%.